Do you ever tell people that you homeschool and then hear them respond, “I’m just not cut out to homeschool?” I hear that one a lot. Frankly, I get quite irritated every time someone says those words to me. I’m sure you get similar comments. Guys, let me be very honest here. Nothing is further from the truth. Can I confess something? I’m not cut out for homeschooling either. And if we take it one step further, I’m not really cut out for motherhood. If you asked most mothers if they thought they were perfect candidates for motherhood, I guarantee you they would reply in the negative. Am I right? Do you feel perfectly qualified as a mother? I absolutely do not. I fail. I’m overwhelmed. I’m unable to do it all. But yet, here we all are – mothers – taking care of our children, working to do what’s best for them, loving them, challenging them, encouraging them, and making mistakes right in front of them. Your imperfections and mine don’t make us any less of a mother. Some days I’m not sure I actually like my children anymore. I’m a perfectionist and the constant mess drives me crazy. I don’t get the “alone time” that I often desperately crave. I get tired of being in my house with munchkin people all day. I’m not sure I remember anything I learned in science. Teaching my children to read makes me feel very inadequate. I frequently worry that I’m “messing up” my children. But here I am. Imperfectly flawed but dedicated. Tired but blessed. Failing but experiencing grace. All of my imperfections don’t make me any less of a homeschooler. They just keep me honest and humble. No, I’m not cut out to homeschool. What would the perfect homeschool mother look like? She would make Wonder Woman and Super Mom seem rather pathetic in comparison. She doesn’t exist. You’re not her. I’m not her. You won’t find her in your homeschool group or in an online forum. You’re simply doing your best to homeschool even though you don’t feel qualified. I’m right there with you. This has been a lesson in failure and grace. I’m not cut out for homeschooling; rather I’m called to homeschool. Even though the days are long, I’m glad I’ve found my current calling. If you’d like some fun reading, check out this post about Homeschool Super Mom. If you’ve ever wondered what she might look like, I’ll share my thoughts on this mythical person. Also, rest assured that I don’t do it all. I struggle to balance homeschooling and housework. You’ll find some encouragement at this post about my many failures and struggles. 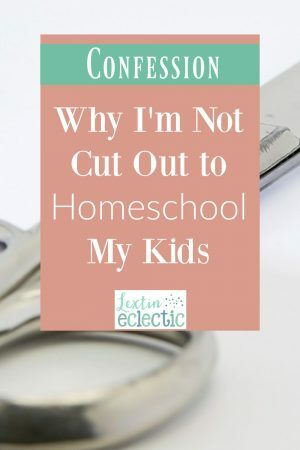 Ohh, and don’t miss my other homeschool mom confessions. If you’d like a funny (and encouraging read) about some real-life homeschool moments, you’ll enjoy this novel about a mom who tried homeschooling as an experiment. Click the picture to read more about it! This was perfection! Thanks Lexi! Thank you! It hasn't been a very pretty week around here……..Whew! It was a reminder to me that this is tough! Love this and you just described me! Welcome! I often come back and reread this post for myself. This homeschool thing is hard! I love this. This is ME. So many people have said this to me as I told them we were homeschooling this year. Yes, I hear this a lot as well. I know I'm not cut out for this job but here I am – just continuing on. It's quite a learning experience! And so very humbling!